Plants grow to between 10 and 25 cm, and flower from June to August. They have a loose basal rosette of small (2-4cm) overwintering round-to-oval leaves which have a slightly rounded toothed edge. These leaves are alternate and are held on short petioles. From the basal rosette a reddish flowering spike grows, which has scale-like leaves and ends in a terminal raceme of white flowers. Each flower has a brownish calyx with 5 pointed sepal tips and 5 white petals, which are held curving inwards so that the overall flower shape is ball-like. There are 8-10 stamens, and a short straight style, 1-2mm long, that does not protrude from the flower. The ovaries are superior and may develop into fruits which remain on the erect stems until the tiny seed is blown away. Round-leaved Wintergreen (Pyrola rotundifolia) is an uncommon and close relative of Common Wintergreen. It is easily distinguished from Common Wintergreen when in flower, as it has open saucer-shaped flowers and a long curved style which protrudes from the petals. There are two subspecies of Round-leaved Wintergreen in Ireland; subsp. maritima found in Wexford and Donegal and subsp. rotundifolia which is found in the centre of Ireland in a very limited geographical area. Common Wintergreen is more likely to be confused with Intermediate Wintergreen (Pyrola media), since the two species have overlapping distributions. When in flower the two can be told apart by the size of the styles; Intermediate Wintergreen’s flowers are longer (4-6mm) and become widened just under the stigma. The basal leaves of Intermediate Wintergreen have more than 16 teeth on each side and have stomata on the underside only. They are mostly found singly, whereas Common Wintergreen may be in clusters of 2 or 3 basal rosettes. Common Wintergreen grows in damp and shady habitats such as woodlands, valleys and heathland. 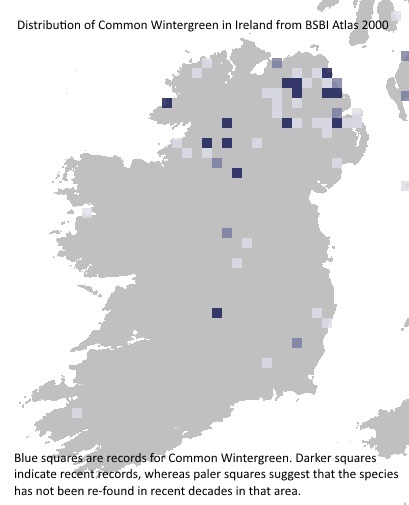 This species is widespread (but not common) across the northern part of Ireland, but is very uncommon and scattered in the south, where most records are over 20 years old. Like many habitats in Ireland they are under threat of being lost due to changes in land use, agricultural improvement, and in some cases, drainage. If you have seen Common Wintergreen, or any of the species in the Irish Species Project, please download the guidance document for detailed instructions and the recording form where you can tell us about the plants you’ve seen (also available at http://www.bsbi.org.uk/ireland.html). You can also get in touch with your local BSBI Vice County Recorder via Maria Long, BSBI Irish Officer (maria.long@bsbi.org) or contact her if you have any questions. One of eight species chosen for the Irish Species Project, a two year recording effort by the Irish division of the Botanical Society of Britain and Ireland (BSBI). All eight species are thought to be declining, at least in parts of their range. Parnell J. and Curtis T. (2012) Webb’s An Irish Flora. Cork: Cork University Press 8th ed. Rose F. and O’Reilly C. (2006) The Wild Flower Key: how to identify wild flowers, trees and shrubs in Britain and Ireland. London: Frederick Warne rev. ed. Stace C. (2010) New Flora of the British Isles. Cambridge; New York: Cambridge University Press 2010 3rd ed.